Robert A. “Fuzz” Wharton, age 88, of Lorain, passed away at his residence on the evening of Friday March 15th while under the care of Mercy New Life Hospice. Bob was born in Lorain on July 25, 1930. A life-long resident of Lorain County, those who new him well would tell you that his true home was on the golf course. He was a graduate of Brookside High School where he was a standout varsity athlete; his accomplishments there lead him to be inducted into the Brookside Hall of Fame. Following graduation, Bob attended Miami University in Oxford. He had been employed as the manager of purchasing and distribution in the Research and Development Center at the B.F. Goodrich Corporation in Brecksville; he retired in 1992 following a career that spanned four decades with the manufacturer. 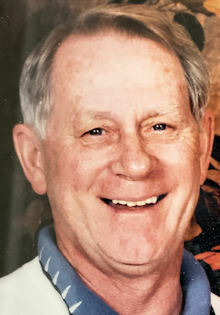 Bob was an advocate for community enrichment and served as Chairman of the Board of Trustees at Lorain County Community College from 1989 to 1995. Upon his appointment, he stated that his mission was to have LCCC become recognized as the best community college in the United States. He never waivered from that objective. Fuzz possessed a passion for the game of golf and seized every opportunity possible to play; he was a long-time member of the Oberlin Golf Club. He also served as the director of the Plain Dealer Junior Golf Tournament from 1980 to 1998. Fuzz joined the Northern Ohio Golf Association (NOGA) in 1993 and later served as the organization’s president. With his guidance, NOGA established the Return to Golf program which assisted countless physically challenged adults, children, and disabled veterans to improve their balance, strength, and self esteem through the creative combination of rehabilitation-based golf fitness and recreational therapy. Regarded by everyone as a “great guy”, he enjoyed hosting parties and spending time with his friends and family when free time permitted. Fuzz is survived by his wife Jeanne (nee Huber), grandson Win Wharton of Los Angeles, California, and best dog friend Margie. He was preceded in death by his son Robert A. “Bobby” Wharton in 2015, parents John and Annie (nee Burns) Wharton, and brothers Frank, Al, and Jack. Visitation will be Saturday March 23rd from 3:00 until 6:00 p.m. in the Gluvna-Shimo-Hromada Funeral Chapel, 3224 Broadway Avenue, Lorain. Interment will be held privately in Calvary Cemetery at a later date.